I mashed up a batch of guacamole with our tender, fragrant bunch of cilantro. It was a flawless clear and warm day with a tickle of a breeze that whispered for margaritas on the deck. California avocados, Roma tomatoes from the farmer’s market, lots of citrus and a crispy bag of tortilla flax chips made the day taste like the best things to come this summer. Cut the avocados in half and remove pits. Using a paring knife, cut the avocado flesh while in the skin, scoring into cube shapes. Use a spoon to scoop the flesh from the skin into a medium bowl. Add tomatoes, garlic, cilantro and the juice of one lemon. Stir to combine and soften the avocado chunks, and then taste for acidity. Add additional lemon juice if needed, then season with salt and pepper. 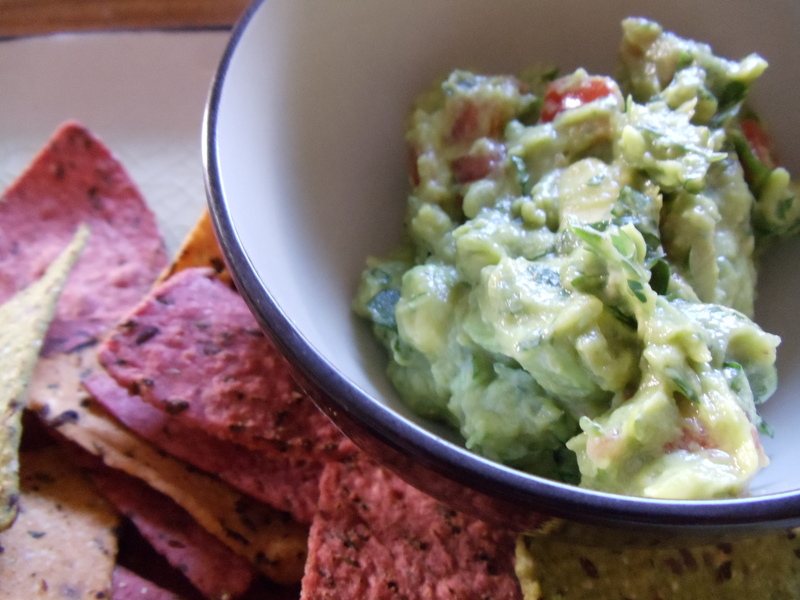 Serve immediately, or refrigerate with plastic wrap sealing the top of the guacamole to prevent oxidation. I like to keep an avocado pit in until I serve the guacamole, I swear it keeps the guacamole from browning.